How many football fans have you spoken to, who prefer this 'modern' offside rule? I'm not sure I have spoken to ONE person who prefers the modern law and how it is interpreted. But this hasn't forced FIFA to revert back to how things are. Everyone has just kind of accepted it. We should think about why the law was ch﻿anged in the first place. It was changed, because those in the corridors of power in FIFA, mistakenly believed that it would make the game more exciting and lead to more goals. Well, it probably (I say probably) has lead to more goals, but it has absolutely not made the game more exciting. It's just made it more frustrating. It's a Mic﻿key Mouse rule and it should be revoked. 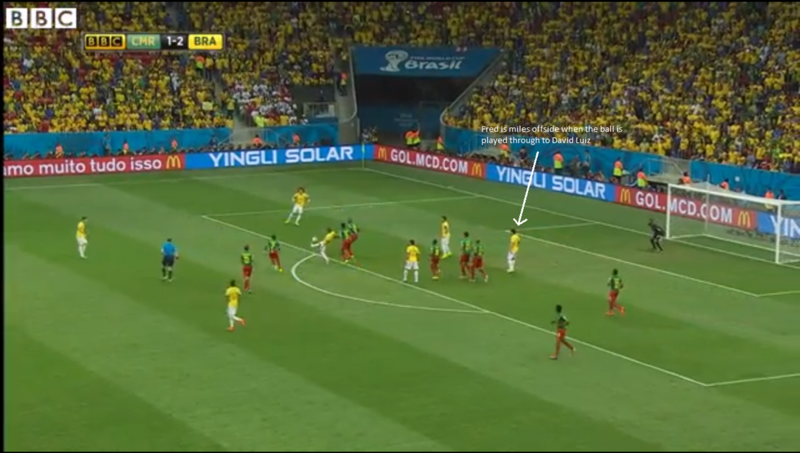 During this year's World Cup, I have seen at least two goals awarded when the player who scored was miles offside when the ball came through - but because that through-ball was passed to a teammate who wasn't offside, the goal was given. This is crazy! Here is an example from the 2014 World Cup. Brazil vs Cameroon. This goal effectively sunk the African nation. But in my opinion, it should never have stood. Here, the ball is played through by Fernandinho, into the path of David Luiz. At this point, Fred is miles offside. However, the flag stays down; presumably because he does not receive the ball directly. However, surely Fred is 'active' and surely he is gaining an advantage by being in that position! David Luiz crosses the ball and Fred taps it in to make it 3-1 to Brazil. In my humble opinion, goals like this should never be given.